The crew at E&E Construction provides expert services for all commercial roofing needs, but even more, they do so with excellent customer care. When you hire E&E, you aren’t just another jobsite or client number – you become like family. We keep our customers informed and educated every step of the way, whether it’s a small repair or complete roof tear-off and new installation. Our technicians are professionally trained to bring an impressive depth of knowledge and expertise to every job, but to also do it in a friendly, approachable way. At E&E, we’re not satisfied until you are. At E&E Construction, we believe that quality comes from a combination of two things: meticulous work practices and the use of high-quality products. Our roofing technicians are factory trained and certified, skilled in the latest industry practices and techniques. We are also members of the National Roofing Contractors Association. Another ingredient to our success is our use of premium products from Conklin Roofing Systems. Their formulated roofing coatings and other products offer superior protection against the elements and provide substantial energy efficiency. Conklin also treats its member companies like family and truly empowers roofers to deliver outstanding workmanship and caring quality. One other thing that sets E&E above the competition is our commitment to “green” building practices. We strive to work in a way that is ecologically responsible and resource-efficient. That means efficiently using water and energy, reducing waste, and using sustainable materials whenever possible. 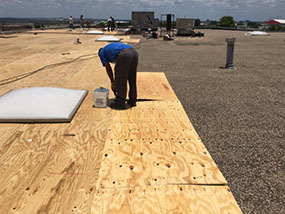 Among commercial roofing companies, E&E stands out. 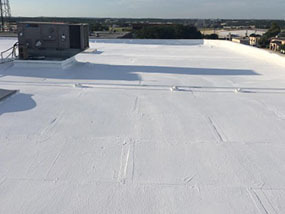 We offer services for all types of commercial roofs, including metal, TPO, PVC, EPDM (rubber), built-up, and more. Call us at (740) 331-0695 today for a free estimate and to experience the E&E difference!